Walk along the Mississippi River levee, and New Orleans’ endless link to water is clear. The city is a series of basins connected like an inverted tortoise shell that stretches to Lake Pontchartrain. Those basins, formed by sinking ground and magnified by a ring of protective levees, mean parts of New Orleans could fill with water whenever it rains. It’s a dilemma as old as the city itself. To answer it, the New Orleans Drainage Commission was formed in 1896 to execute a master drainage plan. The Louisiana Legislature created the Sewerage & Water Board three years later to build and operate safe and sanitary distribution systems to provide drinking water and remove sewage. The Drainage Commission and the S&WB combined in 1903, bringing some of the most essential infrastructure in the City of New Orleans under one agency. The Sewerage & Water Board, however, never let go of its original title, which it holds to this day. Because the river levees are higher than the lake levees, most rainwater is pumped into Lake Pontchartrain. There are 24 drainage pumping stations, collectively housing 120 drainage and constant-duty pumps. 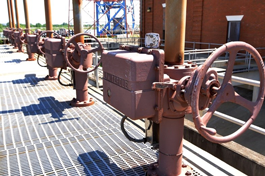 While drainage pumps are activated mitigate rain and flooding, constant-duty pumps work to regulate the amount of water in New Orleans drainage canals on any given day. Stations are staffed or monitored by experienced personnel who are on duty 24 hours a day, seven days a week. There are 12 smaller underpass stations that automatically turn on in response to rising water. These pumps are checked regularly each week and monitored by field personnel during rain events. The S&WB's drainage network includes approximately 90 miles of open canals and 90 miles of subsurface canals. Many of the subsurface canals are large enough to drive a bus through. Much of the drainage system in the "Old City" – the section of the East Bank between the 17th Street Canal, the Industrial Canal, the Mississippi River and Lake Pontchartrain – uses an unusual frequency of electricity known as 25-cycle power. This power is mostly generated by the Sewerage & Water Board at the Carrollton Water Plant. 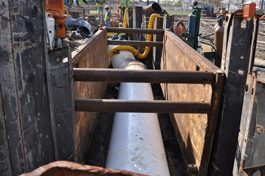 The drainage systems in New Orleans East and the West Bank run on more conventional 60-cycle power supplied by Entergy New Orleans. Operations Department crews watch the canal water level, monitor weather forecasts through a direct tie to the National Weather Service Radar System, communicate with other stations and senior management, and keep informed on weather activity around the city. After the May 1995 flood, the U.S. Congress authorized SELA to reduce flood damage in Orleans, Jefferson and St. Tammany parishes. The Army Corps of Engineers administers the project. The Sewerage & Water Board acts as the corps' local partner. Two new drainage pumping stations, one in Carrollton and a second along the Industrial Canal. Improving two existing drainage stations, DPS #1 in Broadmoor and DPS #13 on the West Bank. Installing or improving several miles of underground drainage canals.